Washington Insect; Photo by Judy Gallagher/Flickr (Use Permitted with Attribution). The idea for adopting the common green darner dragonfly as the insect symbol of Washington was brought to the state legislature by a group of students from Crestwood Elementary School in Kent (students from over 100 school districts state-wide participated in the selection of the green darner dragonfly). Also called "darning needle," "mosquito hawk," and "lord of June," the green darner dragonfly is native to North America and one of the largest and fastest-flying dragonflies. Seen in early spring through fall, the green darner dragonfly is easy to identify with its large size (body length of 2 ¼" to 3 ½"), silvery iridescent wings, bulbous compound eyes, and emerald green thorax with a stripe of deep garnet running down the middle of a blue abdomen. 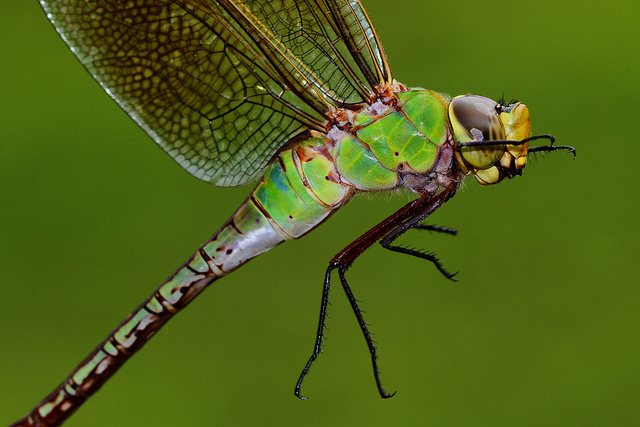 The green darner is one of 38 species of dragonflies common in the United States and Southern Canada. The adult green darner dragonfly is a strong flier - its pattern of movement is in a fast straight line with double backs of "back and forth." Its' wings move in synchronization. Green Darners feed on many insects that are harmful to humans and the environment, especially mosquitoes. Adult green darners catch and eat insects on the wing - they are excellent aerial hunters due to their tremendous flying speed and incredible eyesight. They have powerful jaws to tear apart and chew up their prey. Green darner nymphs are also carnivorous, usually eating aquatic insects, tadpoles, and very small fish.